Please fill in the following details to subscribe to the VIP Club e-newseltter. Once submitted follow the instructions to confirm your subscription. VIP Club is an e-newsletter subscription. A regular e-newsletter of membership benefits will be emailed to designated email address. Should you wish to unsubscribe at any stage, follow the prompts recieved in the e-newsletter. Exclusive discounts and offers throughout the year. Receive tips and information on how to keep your lawn in top condition through the different seasons. This isn’t just a pitch to sell you products, its genuine seasonal advice to help you keep your lawn green and healthy throughout the year. 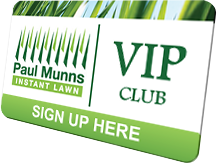 Receive free delivery on any Paul Munn branded product purchase over $50 in the Adelaide metro area.